For some reason, the past couple of weeks have felt like a whirlwind. We have been enjoying lots of snowy days, sunny days, rainy days, and chilly days. 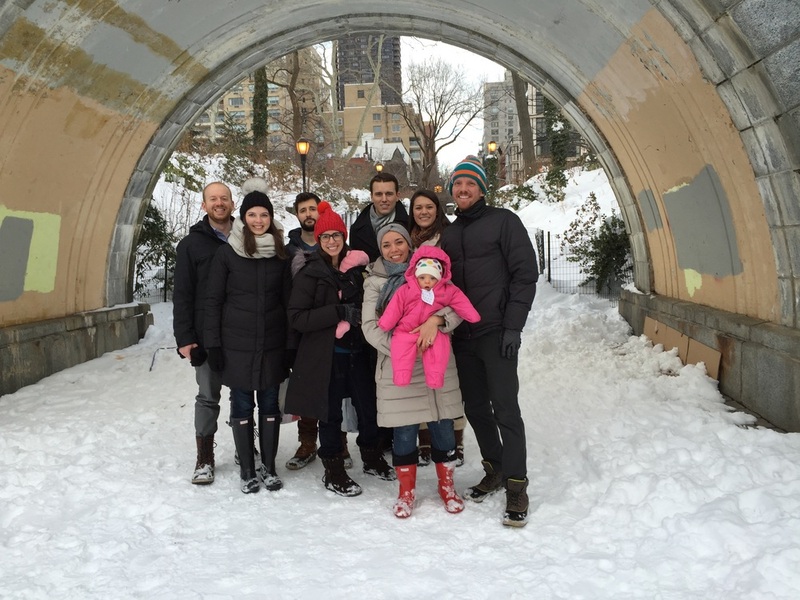 We've been working, playing, spending time with friends, and learning so much from all of Lucie's therapy sessions. It feels overwhelming, tiring and absolutely wonderful all at the same time. Lucie is healthy, strong and thriving so much, so what is there to fuss about, right? But sometimes it just feels like we turn around and think, what day is it? what time is it? how are there still more dishes to do and more laundry and, WOAH, how did Lucie climb up on that table!? (That actually happened!) So, needless to say, we are pretty excited that we will get a mini-break next week when we head out to the Keys for our cousin Cristie's wedding. Hopefully some fun at the beach will give us a re-engergizing boost! So what has the Goose been up to lately? Since our last post, she got to experience her first blizzard! 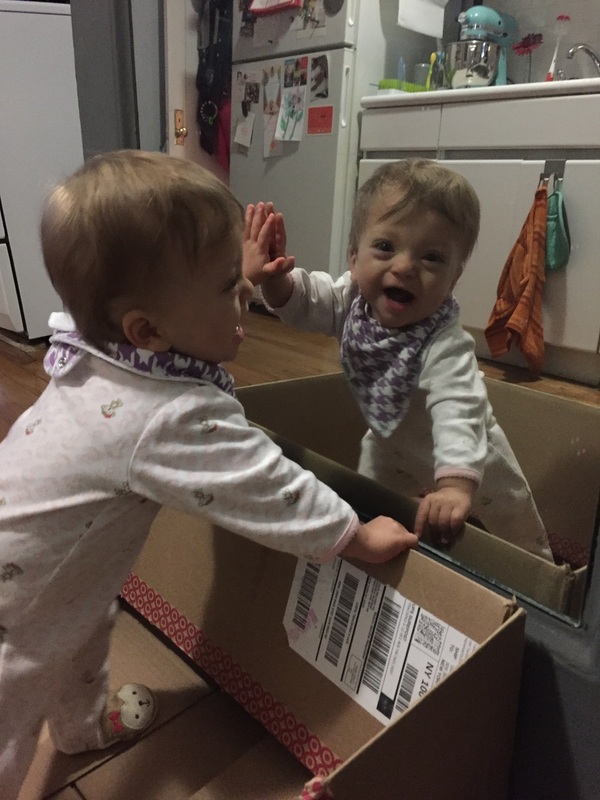 She learned how much fun playing in a box can be, especially if it's in front of a mirror. 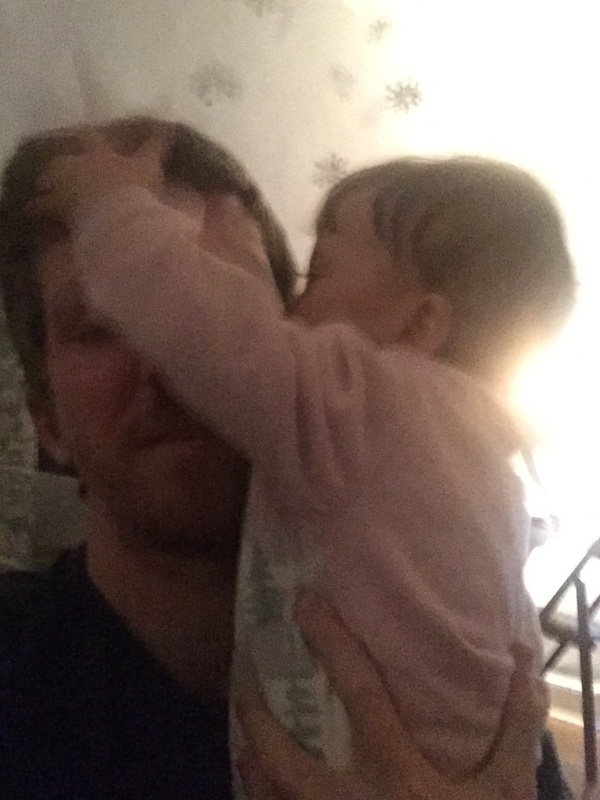 She has started to give BIG, WET, SLOBBERY, LOVING KISSES! She has also started to drink water from cups with straws, which gets a little messy, but she is enjoying it (at least we think she is, haha). 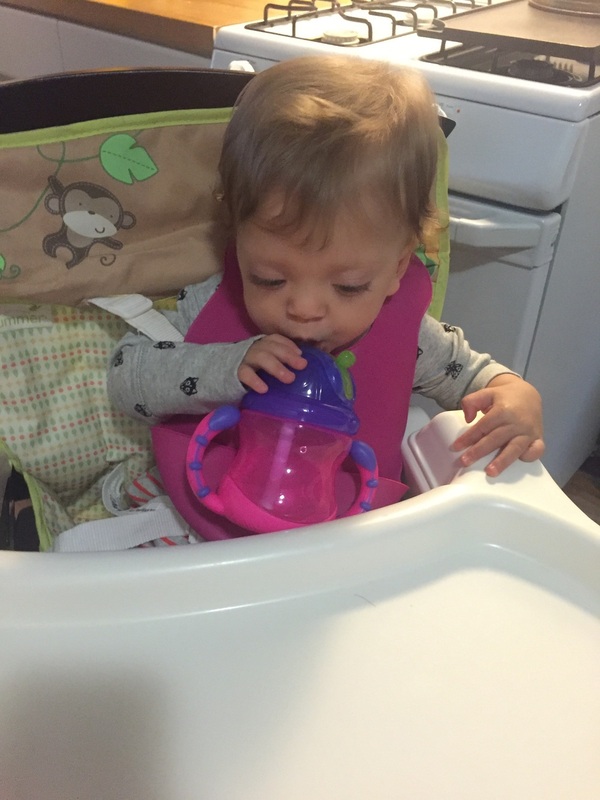 She is working on the pincer grasp in therapy so that she can learn to grab things with her thumb and index finger. She also gets to work through obstacle courses of pillows, chairs and toys! She received a tunnel as a gift, so she has started to work her way through that as well and is discovering more and more fun things to do, play with and explore. It is a thrill to see her be entertained. We are showing her how to pretend to talk on a toy phone, we pretend to go to sleep and wake up, all things to encourage her to start to pretend on her own. She is captivated by us as we pretend to snore and then gets so excited when we "wake up" and say, "Good Morning!" She gives high fives and waves hello and goodbye. She is starting to try to copy some of the things we do, you can tell she wants to even if she doesn't quite get it. We are learning a lot about her personality too! She is determined, such a motivated little girl, she is playful and happy, a little shy, she is also quite stubborn and has a bit of a temper (especially in PT when she gets pushed to her limits). We can see so much of ourselves in her, which is fun and scary at the same time, LOL! It's hard to put into words what it feels like to see Lucie and her life today. This little life that we get to be a part of. This little life that is so BIG to us! We are floored by all of the new things she is doing and we probably look at each other, exhale and say, "Thank you, God", on a daily basis. It's been pretty nostalgic for us right now, especially since this time last year, she was still in the NICU, her grade 3 and grade 4 brain bleeds were just beginning to re-absorb on their own and her doctors were just cautiously optimistic about how things could look in the future. It feels so amazing to get to be more and more optimistic about her progress with each day! Speech therapy is her newest therapy, and from what the therapist has said, this one will be the slowest to see progress of the four. Especially since Lucie-Pie is thriving so much in PT and OT right now. We are really thankful for all the support she is getting through her therapy sessions, even when it makes for a packed week. Oh, hello. Do you like my hair? Loves playing in the mirror. Quick Tip - Don't take a stroller out with you after a nearly record breaking blizzard. Just don't. So proud of herself for ripping her book in two. Love this view, she's growing up so fast. Wanted to try on mommy's boots. Oh the kissess lol. Sooooo slobbery. Getting ready to go through an "obstacle course". Here's your ball, Bess! Let's play! Lucie loooooves the cold and the snow! She smiles so huge every time we step outside in the cool air. Killer Bunnies game night at the Brauns! Lucie's using Luke's play pen for a couple of months so we can eat dinner and she can play safely. After dinner, we all join in on the fun! Lucie. Climbed. Up. On. To. The. Table. WHAT?! We ran into the Fellow from the NICU that helped deliver and take care of Lucie. It was cooler than running into a movie star, she's that much of a rockstar to us! So great running into her in Central Park. Lucie pulled down our DVD case to show us what DVDs are used for these days. Gotta love technology ;). And her "blue steel" look is on fleek! Right? Found mommy's umbrella drying and HAD to check it out! Bess and Lucie making a mad dash for Bess's dinner? Who's going to win tonight? This. Is. Awesome! Why didn't you say how much fun it would be? !